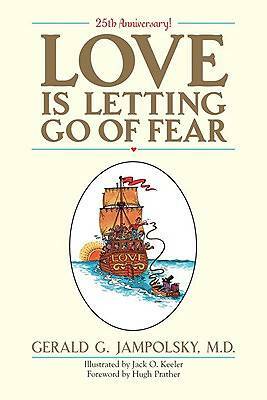 An inspirational classic since 1979, LOVE IS LETTING GO OF FEAR remains one of the seminal works in the transpersonal movement. Psychiatrist Dr. Gerald Jampolsky'¬'s timeless message may be timelier today than ever: the only thing that stands between us and the awesome energy of love is fear. To live without fear, we must stop analyzing it, stop agonizing over it, stop fighting with it, and simply . . . let it go. How? By releasing our paralyzing preoccupation with the past and our chronic apprehension over the future-which is, needless to say, easier said than done. To help us in this difficult journey from fear to love, Dr. Jampolsky presents tools in the form of 12 daily, progressive lessons for personal transformation. These crucial lessons work through the concepts of giving, forgiveness, cause and effect, perspective, reactive behavior, victimhood, judgment, living in the present, releasing the past, visualization, freedom to choose, and taking responsibility. In the 25 years since it was first published, LOVE IS LETTING GO OF FEAR continues to change lives with its frank, thought-provoking, and powerful response to overcoming life'¬'s greatest challenges. The 25th anniversary edition of one of the groundbreaking classics in the transpersonal movement, with a new introduction by the author. Still one of the best books on self-transformation by virtue of its simple, direct message and its 12-lesson approach. Based on concepts from "A Course in Miracles." More than 1 million copies sold.